It's the Lead Elbow, Stupid! Pushing or Pulling Putts? It's the Lead Elbow, Stupid! ZipTip: Stroke: It's the Lead Elbow, Stupid! To keep the putterface moving square and straight thru impact, don't let the lazy lead elbow drift towards your hip, but keep it headed straight along your toe line for a bit past impact. James Hilton ca. 1915 showing the characteristic "open" stance of the era, with a "pushy" stroke down the line that sent the lead elbow away from the hip. Horton Smith's "hooding" that moves the putterhead level thru the ball but requires the lead elbow to "flip out" to make this happen. Notice the open hips and feet. Jack Nicklaus' slightly open shoulderframe and "piston" stroke action that sends the lead elbow away from the hip. Bobby Locke ca. 1950 -- watch his cap twist targetward as his right shoulder comes horizontally forward towards the putt line -- his lead elbow stays headed downline. Leo Diegel ca. 1925 and an early effort to control the rear and lead elbows. Lee Trevino's wristy stroke, in which the lead elbow stays close to the ribs, but the wrists have to break to move the putterhead thru impact -- especially the "push" action from the right wrist. Dave Pelz's pendulum style, in which the lead elbow separates from the still hip. The Oldtime Push Stroke. 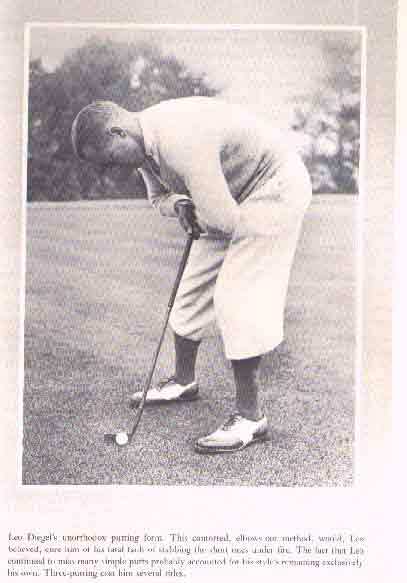 An oldtime pro tip for putting is to anchor the right (hind) elbow on your hip and keep it there throughout the stroke. This requires either a pure-wristy style stroke or at least a hinging forward at the right elbow in the thru-stroke (a la Nicklaus' piston stroke), but the left elbow does not necessarily separate from the left hip as the putterhead moves thru the ball. The left arm and wrist are kept "firm" in the thru-stroke, and this causes the left shoulder to buoy up a bit higher as the follow-thru progresses. The emphasis ends up being on the straightness of the hands' trajectory down the line, and it doesn't really hurt much to stand with the feet or shoulders a little open to the target. Left-eye / right-hand golfers (like Nicklaus) feel like they have a slight "push" in the stroke because the arms and hands are moving out from the body as they go forward down the line from the slightly open stance. It's hard to "pull" a putt when you intend to "push" it right from the start. In any "push" stroke involving the arms (not just a pure wristy stroke), the lead elbow moves away from the hip, and not in a path that parallels the putt line, but in a trajectory somewhat outward towards the putt line. From this setup, a real push happens when the lead elbow moves too much outward toward the putt line. The open setup is actually the dominant setup used around the beginning of the 20th century, as seen in the putting of Walter Travis, Willie Park Jr., and others on up to Gene Sarazen, Byron Nelson, and others around WWII. Not very many pros still putt this way, but I've seen a number of amateurs do it. Today, the dominant setup is "square," with joint pairs aligned parallel to the putt line. From a square setup, what happens with the lead elbow to produce a straight stroke (and avoid pushes and pulls) is not, unfortunately, "straight forward" (so to speak). The "Hooding" Solution. The "hooding" action of Horton Smith and others was occasioned by the "gating" stroke path of the day, and has three separate components: vertical face, square face, and low face. The action keeps the putterface vertical beyond impact with left-wrist flexion. Classically, "hooding" also keeps the putterface aimed the same way it points at address even though the stroke path arcs back and around in the backstroke and then forward and around in the thru-stroke (a "gating" stroke path like Crenshaw's). 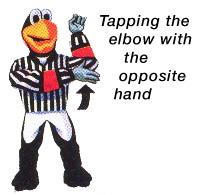 To maintain the face direction in a "gating" stroke, the left wrist rotates counterclockwise going back and then "unrotates" clockwise going forward, and the degree of rotation depends upon the degree of arcing in the path. There may also be an effort to keep the putterhead close to the surface by NOT allowing the left shoulder to rise (or rise much) going into the follow-thru. This is a characteristic shared by Dave Stockton, with his drill of focusing on keeping the back of the left wrist level going thru impact (and to a lesser degree by Loren Roberts, as he allows his right wrist to fold going to the top of the backstroke and then preserves the angles of the wrists going thru -- although his left shoulder rises). The whole emphasis of this style is on the putterface orientation in the stroke movement. Learning and being consistent with the "hooding" motion requires considerable practice, focus, and finesse. Essentially, the golfer has dual attention upon the face orientation AND the trajectory of the hands and wrists in the stroke (staying parallel to the putt line, as in making strokes above a yardstick). The more the hands are positioned out ballward from hanging directly below the shoulder sockets, the more pronounced the rotational "hooding" action in the wrists. If the hands are suspended directly below the shoulder sockets, the only "hooding" is for face verticality and lowness of putterhead, so the "rotational" wrist action is eliminated. But if the stroke path arcs and therefore requires some rotational action, but the golfer forgets, he is asking for a pull! The lesson is: if you want to use "hooding," use a hands-below-shouldersockets setup (to simplify the management) AND in any event know that the left elbow must separate from the hip going thru. If the stroke arcs and the golfer remembers to manage the "hooding" rotation, he ALSO is forced to move the left elbow not only forward from the hip but also away outward from his body closer to the putt line. That is, only when the hands hang below the shoulder sockets does the trajectory of the left elbow stay parallel to the putt line going thru. If the stroke gates, the putterhead will curl forward and back around the body in the thru-stroke UNLESS the left elbow compensates by heading closer to the putt line. This is WAY TOO MUCH TROUBLE, so don't ask for it! Dont use "hooding" without hanging the hands below the shoulders, and ALWAYS let the left elbow separate from the hip going thru. The Bobby Locke Torso-Putt Solution. 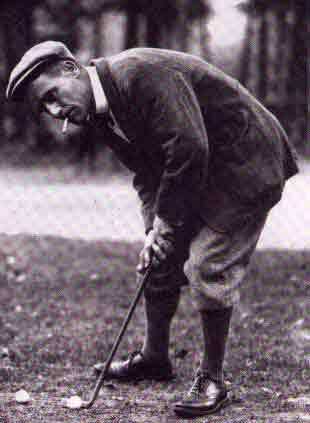 Bobby Locke's putting style was often described as "hooking" the ball into the hole. By this, the observer was pointing up the fact that Locke stood "closed" to the start line, took the putter back to the inside of this line, and delivered the putterhead at the ball from the inside. But this is not the full story. Locke also "hooded" the putter back and thru with wrist manipulations to keep the face aimed the same as at address. But there was something else he did. He kept the shape of his arms pretty much intact throughout the stroke and delivered the putterhead straight thru impact and down the line with some outward movement of his right shoulder. If you looked straight down on Locke from ten feet over his head, and tracked the position of his right shoulder, you would see it curl back as he takes the putter back inside and then uncurl forward as he delivers the blow. This is evidenced by a slight release in his right knee plus a slight lateral move of his head targetward in the thru-stroke as his right shoulder and torso move horizontally out towards the ball and putt line. His torso as a whole has a twisting "opening" action in it. Because his left torso was twisting behind as his putterhead was moving straight on line, Locke's left elbow had to do something other than follow his hip as it turned back -- else he really would have "hooked" his putts hard to the left. Consequently, in his stroke, the left elbow splits the difference and goes back a bit and goes laterally forward from the hip a bit. This makes the left elbow appear to jut out from his body in the follow-thru, but it's really his body moving back away from his elbow as his hands move down the putt line. It's a complicated combination, but ultimately Locke's move is fairly simple to execute and repeat. The Trevino Arms-Hands Push Stroke. The Trevino stroke pictured above illustrates a sqaure setup using a mild form of "piston" or "push" stroke. You will notice that the left wrist stays firm and ends up pretty vertical after impact, with the flat back of the left hand facing the target. This left-wrist orientation is pretty much the same in the putting styles involving "hooding" from the 1930s-1950s and the modern pendulum shoulders-only stroke style. 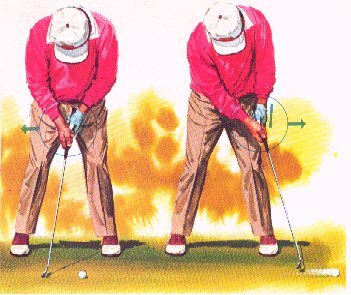 The difference from the Trevino illustration and the other two styles is what happens with the left (lead) elbow. In the Trevino-type stroke, the left elbow does not significantly separate from the hip, and the forearm simply straightens out downward and forward in the thru-stroke. 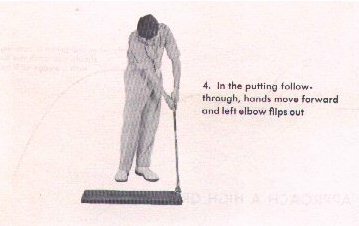 But once the putterhead gets past impact, it is impossible to maintain this arrangement of the arms-hands in motion without the putterhead rising AND there is an ever-present tendency for the stroke to curl back around the body in the follow-thru as in a full swing and/or for the left wrist to "breakdown." Golfers who treat the putt as a miniature version of the full swing are apt to have a little hip rotation in the thru-stroke, as evidenced by some give or release in the right knee (e.g., Bobby Jones and Ben Crenshaw). The hips will assuredly cast the torso curling back also unless prevented. A lot of the times when the golfer blames "moving his head" or "peeking," what actually happens is his hips were rotating. It feels perfectly natural so it's hard to focus on it as "bad" to stifle it from happening. This rotating tendency causes many pulled putts and less-than-solid blows. The Pendulum Solution. The shoulders-only "pendulum" stroke uses "dead" hands and arms. There is no attempt to use wrist action to manage the putterface. The key feature of this style is that the shoulder joint does not alter during the stroke (the armpits don't open or close any), or alters only minimally as the stroke amplitude gets larger for long putts. [The Trevino forearms style is close to this in that the armpits alter very little, since both elbows stay close to the hips.] This feature guarantees that the so-called "triangle" of arms, hands, and putter stays "intact" throughout the stroke, and that means the left elbow must separate from the hip as the stroke goes forward beyond impact. It also means the putterhead will be arcing upward thru impact into the follow-thru, as a true pendulum would, so there is no attempt to manipulate the verticality of lowness of the putterface going thru. With hands-below-shouldersockets, the trajectory of the hands will mirror the symmetrical pendular arcing of the putterhead, so the left shoulder must rise going thru, and hence the left elbow separate from the hip, and the trajectory of the elbow and hands stays in the plane that parallels the vertical plane of the putt arising from the putt line. As with any "gating" stroke, however, there is really only ONE place in the stroke when the face is square to the start line, and that is at the bottom of the stroke arc (or peak of the rainbow-shaped or frown-shaped stroke path), which should coincide with the middle of your stance directly opposite the sternum, chin, and nose. Consequently, for the pendulum style, BALL POSITION matters a lot if your stroke gates. Since you don't manipulate the face in the stroke, if your stroke path "gates," you will push putts if the ball is too far back or pull putts if the ball is too far forward. And the only way out of this bad ball postioning is wrist rotational manipulation on an ad hoc basis. AND if this sort of variable compensation is required by a "gating" path, it also requires that the left elbow not simply separate from the hip along a trajectory paralleling the putt line, but move outward towards the line when the ball is too far forward or back behind the hip if the ball is too far back in the stance. The extent of this outward or backward component in the elbow motion depends not only on the extent of gating, but as well upon ball position. With a lot of "gating" and a ball too far forward of the bottom of the stroke arc, the elbow has to move farther outward towards the puttline than is required by the "gating" alone. When the hands are directly below the shoulder sockets, however, the ball position matters a whole lot less for how the putterface will be pointed at contact. With this setup, ball position is mostly a matter of letting the stroke reach maximum acceleration at the bottom before impacting the ball and a matter of whether the putterface is rising when it meets the back of the ball. The lesson again is: hands below shoulder sockets calls for the left elbow to move forward of the hip on a path parallel to the putt line, and any "gating" requires the elbow path to trend toward the puttline going forward. The case of the inverse "gating" (smile-shaped stroke path) with hands closer to the feet than directly under the shoulder sockets (e.g., Fuzzy Zoeller) is too rare and ill-advised to comment on. Conclusion. Obviously, the title of this tip is meant to be a little humorous, since this elbow action is hardly easy to analyze or describe. For almost all golfers today, though, there is a nice clear bottom line: the left or lead elbow SHOULD move forward in the thru-stroke and separate from the hip, and the question is whether the elbow stays parallel to the putt line or trends toward it (depending on the presence and degree of "gating" in the stroke path). One can note rather clearly that the left elbow should NOT stay at the hip -- this will cause left-wrist "breakdown," weak shots, and pulls, or cause some weird compensatory manipulations. One can also note that the left elbow should NOT move back and around the body going thru, at least for that critical five to six inches past the ball. This elbow action causes pulls or cut strokes. The tricky part is when the elbow needs to move outward toward the putt line, as is caused by a gating stroke path. 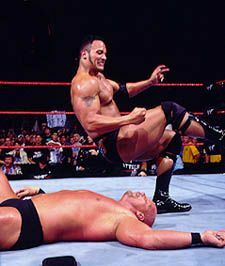 Too much "outward" in the elbow move and you get a push. The simple answer is: don't gate! Keep the hands directly below the shoulder sockets and move the shoulderframe as a unit inside a stable vertical plane of rocking back and thru. Then the elbow move is always and exactly forward and parallel to the setup alignment. So keep the hands below the shoulder sockets and let that elbow go forward from the hip parallel to the startline! If we wanted to amend the old tip about moving your elbows along a rail, it would go something like this: with your hands AND elbows hanging directly beneath your shoulder sockets and your shoulders setup "square," imagine a horizontal club shaft (also aligned parallel to the putt line) between your arms and chest, contacting the back of your upper arms just above the elbows a couple of inches; move your "triangle" so the backs of both upper arms remain in contact with the shaft at all times. To see exactly what this means for the elbow motion, just hold a shaft horizontal in front of your chest at sternum level so it runs parallel to your setup and note particularly that section of the shaft six to ten inches in front of your lead hip. You shouldn't let your elbow ever fall back inside that, and really never get further outward away than that, unless your setup is open or your hands a bit out from your shoulder sockets. You can also "feel" this by holding a shaft across your chest with the right hand and making strokes with a putter held solely in your left hand, sliding the back of the left upper arm along the shaft. So long as your left elbow does not hinge (flex inward) and your left wrist stays unchanged, your left shoulder will have to rise vertically up a little in the thru-stroke. The shoulder will not curl backwards any at all, and will only move straight up. That's the ticket to get rid of pushes and pulls.